HOW TO – Using XBees to create a wireless bi-directional MIDI link « Adafruit Industries – Makers, hackers, artists, designers and engineers! Overview video on using 2 Xbee modules, Adafruit adapter kits and FTDI cable to transmit MIDI wirelessly. If you have a modern musical instrument, theres a good chance it has a MIDI port. MIDI is an ancient serial protocol that runs at 31.25Kbs, often they come in pairs an Input and Output. Setting up MIDI gear usually requires lots of cabling, tying inputs to outputs across a studio or stage. 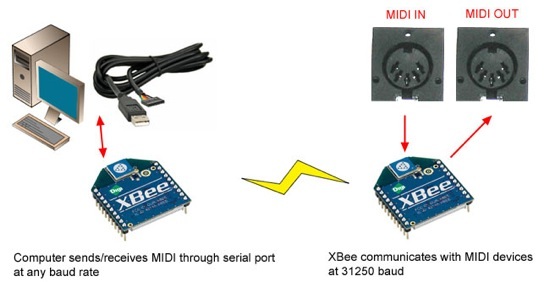 In this XBee tutorial we’ll show how to configure the XBee to talk at the MIDI baud rate, and then how to create a bi-directional wireless MIDI link… (m4v). – Is it possible to have this system for MIDI to MIDI. I tried this “Midified” driver and it simply did not work. Even though this driver shows up in my device manager, it won’t communicate at 31250 baud. Now I’m left with an xbee I can’t communicate with because it’s set to 31250 baud. I tried this Midified driver and it simply did not work. Even though this driver shows up in my device manager, it won’t communicate at 31250 baud. Now I’m left with an xbee I can’t communicate with because it’s set to 31250 baud.